Thanks For The Massage Table Gr8tergud! My very good friend Reshma helped me get my massage table from Gr8tergud﻿. Thanks to the massage table, my back will no longer be sore when doing the Tactile Integration and Oralfacial Reflex therapy for my two daughters. Gr8tergud is a not-for-profit organisation set up by Reshma Yousuf to provide more resources and opportunities for the autism community in Malaysia. Gr8tergud aims to bring more career opportunities to young adults with autism. Go get your massage table now! I am a mother of 2 children who are now recovered from autism. In my journey of healing and recovering them, I learnt that anything is possible. As a mother and autism advocate, I share with you some valuable lessons I learnt in my journey. When both my daughters were diagnosed with autism, in the midst of my grief, I had to pick myself up and figure out a way to help my children. What do I do, where do I go, how do I start? For families who have just received the autism diagnosis, believe in HOPE. Without hope, you have already lost the fight before you’ve even begun. Always believe that our children can improve and even recover. How you respond to something will determine your outcome. If you choose to walk down this path full of fear, anger, hate, scepticism, negativity, sorrow, or jealousy, expect to receive the same in return. The first few months after my daughter received the autism diagnosis, I lived in a life ruled by fear. Fear of the future, fear of the unknown, fear of taking risks, fear of making the wrong decisions, fear of whether I can do what it takes to help my child. A life led by fear is not healthy. It also stops you from moving forward. It was a lonely, scary journey. I realised that this is not helping my child at all. The fear is still there, it will never go away I think. However, the difference is, I no longer let the fear stop me from doing what is best for my child. You’ve probably heard of the law of attraction. The philosophy of ‘like attracts like’ is extremely powerful. If you have a lousy attitude, chances are, no one is clamouring to help you and your child. More often than not, you will meet resistance and hostility. Reset your attitude, you will be surprised to how much more you will receive in return. There is an infinite amount of love, hope and positivity in the universe. You just have to reset your frequency to tune in to that positive abundance. Surround yourself with positive, supportive and encouraging people. These are the ones who will stay with you along the way and cheer you on. Don’t waste your precious time and energy on negative people who will only hold you back and make you feel worthless. They will drag you down instead of helping you up. To the ones who make you angry or say hurtful things, just smile and walk away. Don’t scream at others. Screaming doesn’t help the situation, it only makes things worse. If you have done wrong, apologise. Fighting only zaps your energy. Don’t fight in front of your children, they can hear you and remember what you said. Autistic children are not deaf. Don’t forget to hug and kiss your child. Even if you think they’re not listening, always tell them how proud you are of them. Love them and kiss them everyday, this is better than any therapy or medication. Don’t forget to surround your child’s space with positivity too. They need it. Always treat your therapists, service providers and medical professionals with respect. They are there to help your child. Always pay them on time. Consistently paying them late is a sign of disrespect and lack of character on your part. Being rude or mean to them is just cultivating negative emotions. Surely you don’t want your child to be treated or taught by people full of anger and resentment right? Choose hope and positivity. Expect this to be a journey full of challenges and pitfalls. But also expect pleasant surprises and wonderful progress. Autism never stops, it never takes a day off, it never gives us a break. Our children live in autism 24 hours a day. Always treat our children with kindness and respect, we can only guess how it feels to live in their bodies. Trust me, it’s easier and happier to travel this journey when you fill your inner space with positivity and surround yourself with the right people. 3. You are what you eat! Clean up your child’s diet immediately and focus on healthy, nutrient-dense foods. My daughter responded positively to the GFCF diet. Within the first week of the diet, she spoke her first word! I went gluten-free, casein-free, soy-free and egg-free. Omit all gluten (wheat, oats, rye, barley) and casein (cow and goat milk-based products, milk, yoghurt, cheese, butter) I stopped soy too because soy’s biochemical properties are very similar to casein, plus majority of autism kids test very high intolerance to soy. Most ASD kids also have very high intolerance, if not allergies, to eggs. Incorporate nutrient dense foods in your family’s diet. Go organic and GMO-free if possible. Choose grass-fed, free-range, antibiotic-free meats. Very important to reduce or stop processed, packaged foods and drinks that contains preservatives, colorings, flavorings, artificial sweetener, caffeine. Stay away from sugar and high fructose corn syrup. These really affect our kids and behavior! Do the diet 100%. Yes, there are other kids eating junk food and bread in front of your child. Your child WILL try to eat forbidden foods. Yes, other family members don’t want to follow the diet. Yes, grandparents will smuggle a bit of ice cream in. There will be transgressions, it happens. Start the diet again. Find a way to make it work. Eventually, the diet becomes 2nd nature. Many children with autism suffer from gastrointestinal issues, oxidative stress, nutritional deficiencies, immune dysregulation, inflammation, allergies, chronic infections, and disorders resulting from environmental toxins. Treat the underlying medical illness, a healthy body means a healthy mind. If your child has chronic constipation, diarrhea, unable to eat, frequent infections and illness, do not make autism an excuse not to treat your child. Not everything in autism is behavioral, some are medical conditions that needs medical treatment. Every child deserves good health, autism or not. Everyone deserves good health and medical treatment during illness, whether they are young or old. Make an appointment with a biomedical doctor. They will help you address the underlying medical issues that are common in our children. Click here for Biomed Doctors. There are other treatments that are highly beneficial for children with autism and ADHD, including homeopathy, osteopathy, cranial sacral therapy, essential oils, to name a few. Please consult with a medical doctor or a healthcare professional to manage your child’s treatment. There are many types of therapies that are beneficial for our kids. In my opinion, any therapy you choose should be intensive, consistent, preferably 1 on 1 therapy. For many children who are new to diagnosis, larger student to teacher ratio may not be suitable initially. It is important to invest in a good quality therapy or therapies that are consistent, frequent and conducted by trained professionals. Choose therapies that are targeted at addressing your child’s needs. The therapy should adapt to suit your child, not the other way round. Remember, early intervention is key! I did 1:1 ABA therapy (Applied Behavior Analysis) for my daughter, and I can’t recommend it enough. When she was first diagnosed, I did home based ABA, 15 hours of therapy a week. By the time she was 3 years old, I changed to centre-based ABA, with 30 hours a week of therapy. That made a HUGE difference in her progress. There are pros for home-based as well as centre-based therapy. Ultimately, I chose centre-based therapy as there were many more benefits compared to home-based therapy for my daughter. Doing home-based therapy was fine for a while, but after some time, I found many aspects of her development were not addressed enough if I kept her home all the time. Centre-based therapy helped with social-skills, generalisation, flexibility and also is a gentle transition to a mainstream school environment. Also, on the plus side, she had access to many more variety of toys, reinforcers and games at the school. And there were lots of therapists and other children there to play with. 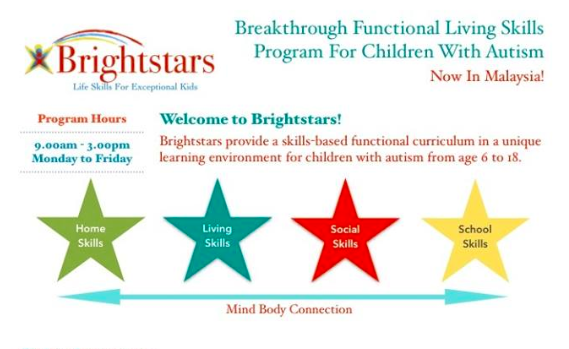 I am the co-founder of Brightstars, it is a holistic school for children with autism, ADHD and learning challenges. I set up the school with my 2 good friends who are also mothers of children with autism. We have always dreamt of a school that had all the best therapies and programs that we felt were most beneficial to special-needs school. We dreamt of a school that focuses on quality rather than quantity. A school with a 1 to 1 student to therapist ratio. A school filled with the best, brightest and most compassionate therapists ever. A school that was sensory-friendly, quiet and calm. Most kids with autism find noisy and busy schools a sensory nightmare. So we put great thought in the design of the school. I wanted a school that was comfortable, friendly and fun. Most importantly, I wanted a school where each child can reach their fullest potential. Get connected, get educated, start surfing – join the KL Biomed FB Group to connect with other parents who are doing nutritional approach, biomedical treatments and various therapies. Don’t forget to check out The Thinking Moms’ Revolution and connect with them on Facebook. Get acquainted with other parents, they will be your main source of support on this often long and lonely journey. Take care of your physical, mental and emotional health. Don’t be afraid to ask for help. Don’t forget to eat well, get enough sleep, exercise and eat healthy. By taking care of my health, I was more equipped to handle the stress and rigours of special-needs parenting. I could do more for my child when I myself was healthy. Don’t forget to nourish your soul- go for a massage, go to a salon for a hair wash, go for a swim, go to the cinema, walk in the park, have an afternoon nap or go for a coffee with a friend. Try to do something just for yourself once a week. Without you, you child will not improve. I take supplements, eat healthy, try to exercise and I make personal time for myself regularly. I feel all the better to face the challenges that autism throws at me everyday. Not everyone will have the resources to afford this, not everyone is blessed with helpful family members or friends who can share the burden and give us the break we need. As far as autism parents go, I am extremely lucky indeed and I count my blessings. Manage your resources wisely, however little we may have. It is hard to strive for recovery when the mum is in deep depression and under extreme stress, the goalpost seems further away when we feel bleak, dejected and pessimistic. If you are married, take care of your relationship. You are not the only one grieving, your spouse is too. Along the way, you will lose your sense of humour. Try to regain that, you will need it. Have patience. Learn to forgive. Don’t forget to pray. Only pray for good things. Worrying is praying for bad things. So, pray for good things. Set realistic goals. Give yourself small challenges. Don’t sweat the small stuff, look at the big picture. Celebrate the victories, small or big. Mourn the losses, but pick yourself up and keep going to the next level. I always tell parents to focus on what they can do. Don’t focus on the things that you cannot do. Focusing on the things that you don’t have, can’t do, can’t afford etc, is a waste of time and energy. Instead, put your energy into the positive actions that you can do TODAY. Be realistic in your expectations. There is no miracle cure, no magic pill, no one size fits all when it comes to autism. It takes hard work, perseverance and TIME for our kids to improve. Expecting a child with 3 years worth of speech delays, behavioural issues and sensory disorders to improve drastically within just 6 months of therapy and treatment is unrealistic. You cannot catch up with years of delays in just a few short months. Anyone who promises you miracles cures or instant results, be wary. Think big, aim high. Don’t underestimate your special child, you might just be pleasantly surprised. Don’t let anybody hold you or your child back. It is not your fault. Your child’s autism was not caused by bad parenting. Blaming yourself only brings you down. Ultimately, you need to move on. Don’t waste your time on guilt, it is counter-productive. It’s not helping your child. Remember to go through this journey with grace and dignity. Our children are voiceless, it is up to us to speak up for them. Don’t forget why we do this, out of love for our children. A smile goes a long way, a thank you even longer. Don’t forget those who have helped you along the way, pay it forward in the hopes that you too can help the next new parent that comes your way.